Café of Life’s Christmas Party for Needy Children took place this morning, Saturday, Dec. 23, at 10 a.m. at Leitner Neighborhood Park in Bonita Springs. This is the 12th year the nonprofit organization has hosted the event. 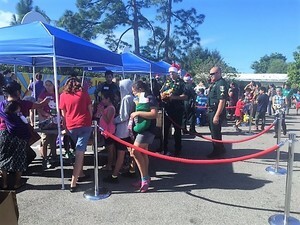 Toys, gift cards and goodie bags were distributed to about 150 children in need in the Bonita Springs area. Gifts were delivered to the park by the Lee County Sheriff’s Department with lights flashing and sirens blaring. A meal was also served to guests. Gifts were donated by Worthington Country Club, The Florencia at the Colony, Pelican's Nest Golf Club at Pelican Landing and Estero Methodist Church, as well as individual donors in addition to Café of Life. In addition to the goodwill nature of this annual event, the nonprofit distributed gift bags to singles/homeless men and women in the area during the week leading up. Refreshments were served by volunteers, including local Girl Scouts. Even Santa Claus made an appearance. Founded in 1998, Café of Life started out offering coffee to a group of the homeless, who were living in the woods in Bonita Springs. From there, it became "a fixture in Bonita Springs, serving luncheon meals, Monday through Friday, to individuals and families from all walks of life," according to its website. Café of Life's purpose is to help in meeting the basic needs of the less fortunate people of Bonita Springs. It is an agency of the United Way of Lee County. Volunteers serve an average of 70 hot meals per day. For more information, visit cafeoflife.org.